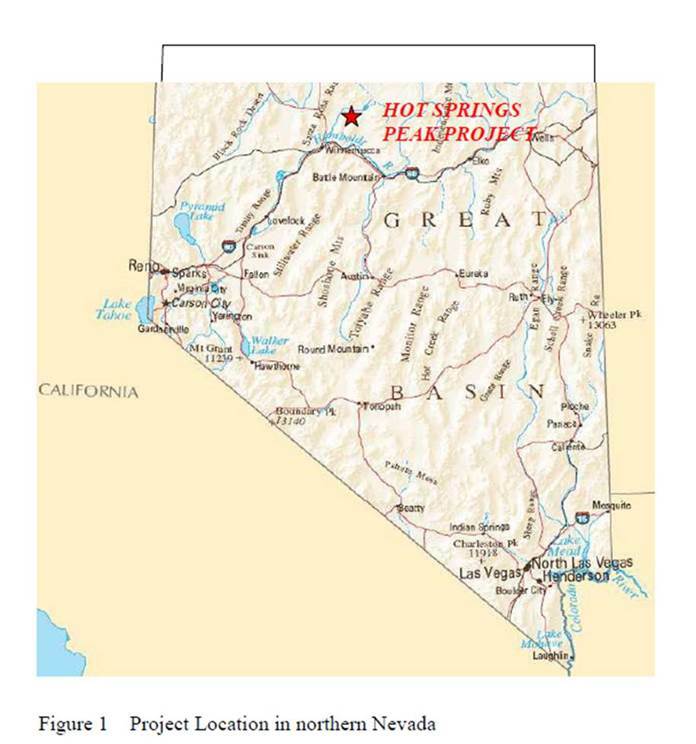 Precious metals expert Michael Ballanger profiles a company that recently merged with Buena Vista Gold and explains why he believes the company’s large land holdings in Nevada have the potential to become a world-class asset. The state of Nevada has always been a source of fascination for me ever since 1982 when I was in the early stages of my career as a stockbroker. I was chatting with our mining analyst at the time and in response to my inquiry as to whether he had any “good gold plays” that I might recommend to my clients, he mentioned a highly speculative junior exploration company listed on the old infamous Vancouver Stock Exchange called American Barrick Resources Corp., which was attempting to produce gold from an open pit located in Eureka County. The knock, he said, was that the CEO was a failed promoter called Peter Munk whose Clairtone deal had blown up a few years earlier and this exploration deal was to be his resurgence. There are countless versions as to the steps preceding the “event,” but one version was that just before the seasonal break, two employees instructed to drill a hole into the open pit were actually goofing off with a case of beer and a deck of cards when they were busted by the general manager and subsequently ordered to drill a 500-foot hole by the morning or there would be no Christmas bonus. Allegedly, they drilled well below the bottom of the pit and through 300 feet of three-quarter-ounce gold sending the stock screaming northwards and stenciling the name “Goldstrike” into the hearts and minds of every speculator on the planet. The discovery of the new Betze-Post zones eventually became a deposit that was 6,000 feet (1,800m) long, 600 feet (180m) thick and 800 feet (240m) wide. In 2007 the average processed gold grade was 0.136 troy ounces (4.2 g) per ton of ore, with a recovery rate of 85.5%. Goldstrike went on to produce over 42 million ounces of gold as of 2016 but the performance of the stock after the discovery was astounding. I owned 2,000 shares bought at $1.85 in 2002 and sold it into the discovery mania at $8.00 and thought I had won a lottery. Ten years later, it was a $2,000 stock (adjusted for splits). This Nevada discovery ended up building an entire industry in Nevada, a hospital wing in Toronto, and countless millionaires along the way, which is why the state of Nevada is always on my radar screen. In mid-2016 I was introduced to a private company called Buena Vista Gold Inc., which was in possession of two large project areas with six identified gold and base metals targets located in both Getchell and Northern Nevada Rift trends, both of which have a combined gold production exceeding 130 million ounces. It was all pretty standard “grassroots” exploration until 2017 when it completed an aeromagnetic survey on their flagship Hot Springs Peak property (HSP), which revealed a very large Carlin-style footprint over a 3 km by 2 km area. By comparison, the geophysical signature that became the Goldstrike deposit was 0.5 km by 1 km in area. It was followed up earlier this year with an I.P. 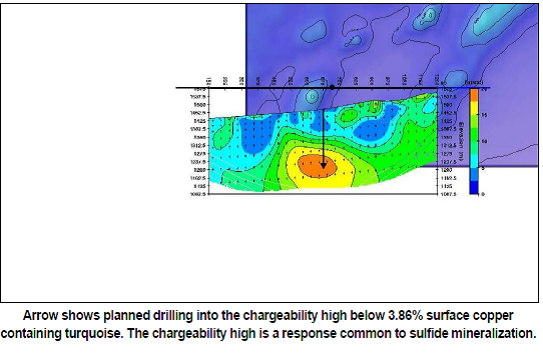 (induced polarization) survey revealing extremely high chargeability/resistivity usually associated with sulphide mineralization and possibly silicification. Furthermore, surface rock chip sampling confirmed the presence of multiple elements of a gold-mineralized system that occur at surface and follow the geophysical responses in the sub-surface. These elements included the very important pathfinder minerals commonly associated with gold deposits and they include gold-arsenic mineralization, widespread spotted hornfels alteration and silicification. Above the central portion of the IP target is the presence of waste dumps surrounding mine shafts created by prospectors likely in the early 1900s mined underground from gold enriched silicified fault zones along the side of the ridge, leaving behind waste dumps that were tested last year and confirmed gold grade as high as 0.701 ounces per tonne (OPT). A foundation of a small crushing plant was located last year. The old-timers sunk shafts on the quartz vein structures where crushing and panning produced “color” and the old timers normally did not leave high grade on the dump. 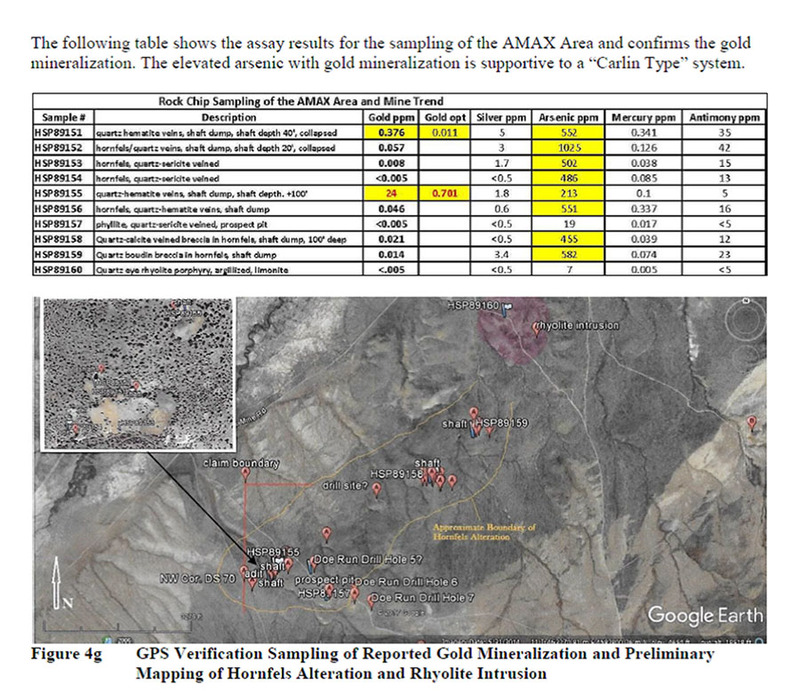 That leaves the question of “What was the grade they hauled away?” Also, gold in Carlin-style systems is normally micron in size and not readily recovered by panning, hence no placers and visible gold is not observed in the silicification. Pivotal to the success of any investment is a process called due diligence and an integral part of the process is understanding management. In the exploration game, it has always been said that successful geologists rarely make just one discovery; they usually repeat the feat sometimes multiple times. The experience of correlating the data and selecting a target is many times an “ad hoc” decision and involves more “gut feel” than analytical certainty. The Qualified Person for this project is Tim Master, who obtained his Masters of Science degree from the University of Wyoming in 1977 and has worked in generative exploration through resource development over a 40-year period with the majority of work in Carlin-type systems but also porphyry copper and epithermal gold of which the Getchell Gold projects are part. Tim put together the Railroad-Pinion Project for Royal Standard Minerals who sold it to Gold Standard Ventures Corp. (GSV:TSX.V; GSV:NYSE); he put together the resources and did the land-lease consolidation and targeting of the discoveries by Gold Standard Ventures made in 2015 (and resulted in a tenfold increase in GSV’s stock price). To have an individual in the field of Tim’s caliber and experience is an obvious advantage when deciding to invest as it meets the initial minimum threshold of due diligence. I met with the chairman, CEO, and director of BVG, Bill Wagener, in Toronto this month and was impressed with his adherence to detail in areas pertaining to finance and listings. We discussed GTCH securing a QB listing in the U.S., which makes it infinitely easier for U.S. investors to trade. This is critical for many of my U.S. friends who show continuing interest in Canadian resource companies and since this is strictly a Nevada play, it makes good sense. Bill also recognizes the need to market the story aggressively, and that is important in maintaining and enhancing shareholder values. 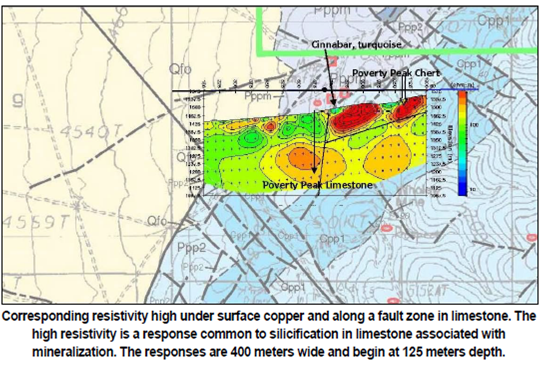 In addition to HSP, the Company has five other assets contained in the Buena Vista portfolio and is in the process of interpreting aeromagnetic IP/Resistivity surveys on the second-ranked project, an oxide copper-gold porphyry prospect, mined near surface, with a geophysical signature indicating sulfides and a possible intrusion below the oxide copper,known as Star Point. The remaining four Buena Vista properties are Star South, Gold Knob, Gold Knob South-West, Jasperoid Peak and the latest discovery of the Hot Springs Canyon Carlin-style target generated from mapping and recent geophysics, to be released in the near future. The first two are porphyry-skarn-type targets, the second two are Carlin-style, while while Jasperoid Peak is a hot spring bonanza vein-type where prior drilling revealed 1.5 meters of 8 g/t Au material. The company intends to entertain joint venture proposals on the southern half of Buena Vista due to the enormous size of the project (15 km X 3 km),but well-located assets that could become a source of financing down the line. Buena Vista Gold Inc. recently merged with CSE-listed Getchell Gold Corp. (GTCH:CSE); the shares will be posted for trading on the Canadian Stock Exchange under symbol GTCH on December 3. 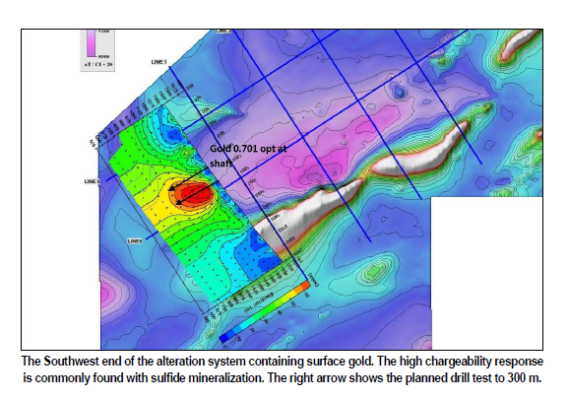 The company recently closed a small private placement consisting of a $0.45 unit including a full warrant at $0.52, the proceeds of which will finance four reverse circulation drill holes at HSP by year-end in order to better understand the geophysical signatures of the surface alteration and gold-copper mineralization outlined in Phase 2 of the NI 43-101 report. This is a sound move as it will serve to further de-risk the project and fine tune targeting for core drilling in the spring. 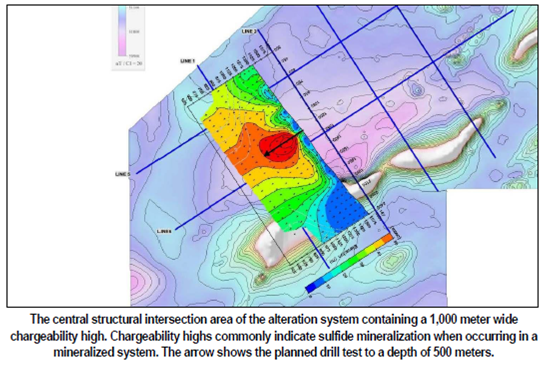 The first hole is to be drilled to a depth of 500 meters into an area of an intense magnetic low with corresponding highs in chargeability and resistivity, reflecting what is believed to be a continuation of the surface hornfels alteration into the sub-surface where the high chargeability indicates the presence of sulphide mineralization. Hole #1 is an attempt to drill into the top of the central zone of the system where the chargeability and resistivity responses are 1,000 meters wide. Hole #2 is targeting the area below the high-grade dumps mentioned earlier. Hole #3 will be drilled to the northeast end of the system where limestone is expected to be intersected with similar geophysical responses. The fourth and final hole will be drilled into an area two kilometers to the south where surface mineralization included turquoise, cinnabar and copper up to 3.86%. In summary, what large professional and institutional investors look for in junior exploration companies are 100%-owned projects that contain sufficient “scale” so as to potentially qualify as a “world-class” asset, in that they are the “tier ones” of this world. They are called “tier one assets” because they are so rich, they stand apart from others, are able to destabilize economies, can disrupt the overall demand-supply balance and be the springboard for building mighty mining companies. 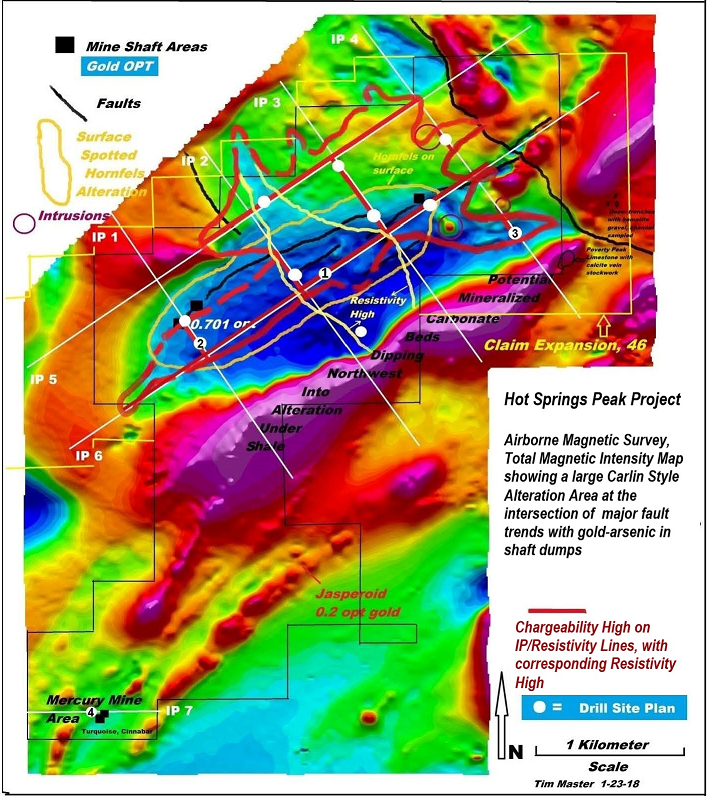 In the two main projects discussed earlier, Hot Springs Peak and Star Point, the geophysical signatures have confirmed this degree of scale while the geochemistry has provided surface evidence of the right pathfinder minerals such as mercury and arsenic and of the sought-after metals themselves, gold and copper. As with all exploration programs, it will all boil down to core drilling and metallurgical testing to define the size and recoverability of the mineralization found. However, since the Hot Springs Peak project has already been prepared for drilling by way of money spent in 2017 and 2018, the upcoming drill program will be an exciting launch for all Getchell Gold Corp. shareholders, both current and prospective. The base case for investing in GTCH lies in the history of Nevada discoveries with major gold discoveries being immediately revalued significantly higher. Gold Standard Ventures, mentioned earlier, trades at a $480 million market cap (up from $40 million pre-discovery) after having made the Railroad-Pinion discovery in 2015. Using the $0.45 unit price from late October as a bid price, the fully diluted market cap for GTCH is in the $15 million range for an extensive land package in a mining-friendly jurisdiction, which is reasonable given the upside potential. Drilling begins mid-to-late November. Symbol: GTCH:CSE. Begins trading on Dec. 3, 2018. Target price: C$1.42 (6 month) (C$50 million market cap) subject to revision post-drilling. 1) Michael J. Ballanger: I, or members of my immediate household or family, own shares of the following companies mentioned in this article: Getchell Gold Corp. My company has a financial relationship with the following companies referred to in this article: Getchell Gold Corp. I determined which companies would be included in this article based on my research and understanding of the sector. Additional disclosures are below. 2) The following companies mentioned in this article are billboard sponsors of Streetwise Reports: Gold Standard Ventures. Click here for important disclosures about sponsor fees. The information provided above is for informational purposes only and is not a recommendation to buy or sell any security. 5) From time to time, Streetwise Reports LLC and its directors, officers, employees or members of their families, as well as persons interviewed for articles and interviews on the site, may have a long or short position in securities mentioned. Directors, officers, employees or members of their immediate families are prohibited from making purchases and/or sales of those securities in the open market or otherwise from the time of the interview or the decision to write an article until three business days after the publication of the interview or article. The foregoing prohibition does not apply to articles that in substance only restate previously published company releases. As of the date of this article, officers and/or employees of Streetwise Reports LLC (including members of their household) own securities of Getchell Gold Corp., a company mentioned in this article. Charts and images courtesy of Michael Ballanger.